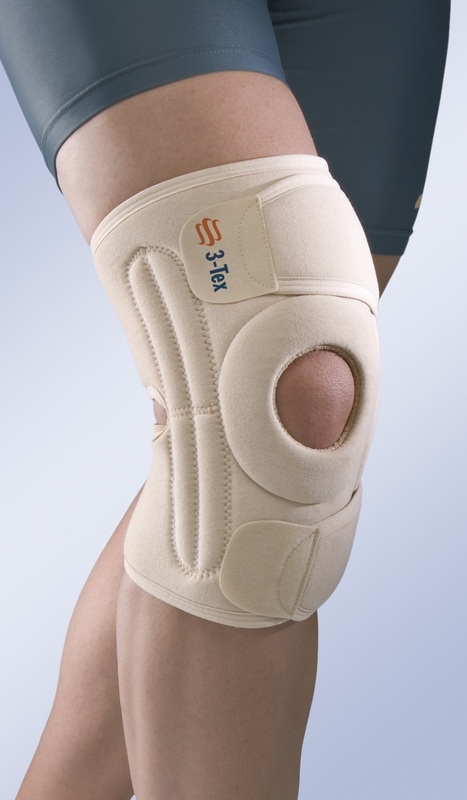 Knee support with breathable fabrics, open patella,, flexible lateral stays. Knee support manufactured with breathable fabrics, open patella,, flexible lateral stays, popliteal opening and wrap-around closure system formed by 2 straps that are part of the knee support itself, wrapping around the thigh and calf, with a hook and loop closure. Incorporates the final tab closure for easy opening and closing. Indications:Postsurgical knee treatments, Thanks to its design, this orthosis is indicated for use in those situations in which a quick fitting of orthosis is desired, or when a variation in the compression is required, depending on the activity (sport activities, in which compression is required for mechanical exertion, work activities, etc..), Patients with morphological deformities which would otherwise entail difficulties in orthosis fitting.